Habit: Annual to subshrub; sap clear; generally monoecious; hairs 0 or generally 2-branched, generally appressed. Stem: spreading to erect, 1--10 dm. Leaf: alternate, stipuled. Inflorescence: raceme, axillary; staminate flowers generally distal to pistillate flowers; axis appressed- to spreading-hairy; bracts entire. Staminate Flower: sepals 5, edges abutting in bud; petals 5; stamens 5--15, generally in 2 sets, some > others, filaments fused into a column, staminodes 0--3 at column tip. Pistillate Flower: sepals 5, overlapping in bud; petals 5; nectar disk +- dissected; ovary 3-chambered, styles 3, 2-lobed. Fruit: smooth. Seed: surface +- striate to pitted [net-like]; scar not appendaged. Habit: Subshrub. Stem: generally erect, 1--5 dm, brittle, appressed-hairy. Leaf: 2--6 cm; stipules +- 1 mm, entire; blade lanceolate, densely hairy, entire. Staminate Flower: sepals 2.5--3 mm, hairy; petals 3--3.5 mm, abaxially hairy; stamen column +- 1.5 mm. Pistillate Flower: sepals 3--4 mm, entire; petals +- = sepals, lanceolate to ovate, abaxially hairy; ovary densely appressed-hairy, styles generally free, lobe tips expanded. Fruit: 3--5 mm. Seed: 2--2.5 mm, angled, pitted. Synonyms: Argythamnia lanceolata (Benth.) Müll. Arg. 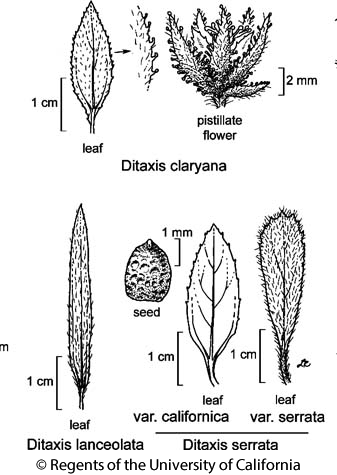 Citation for this treatment: Mark H. Mayfield & Grady L. Webster 2012, Ditaxis lanceolata, in Jepson Flora Project (eds.) Jepson eFlora, http://ucjeps.berkeley.edu/eflora/eflora_display.php?tid=23174, accessed on April 22, 2019. DMoj (Eagle Mtn), DSon; Markers link to CCH specimen records. Yellow markers indicate records that may provide evidence for eFlora range revision or may have georeferencing or identification issues. Purple markers indicate specimens collected from a garden, greenhouse, or other non-wild location.